A paranormal short story set in Scotland, with cultural heritage at its heart. 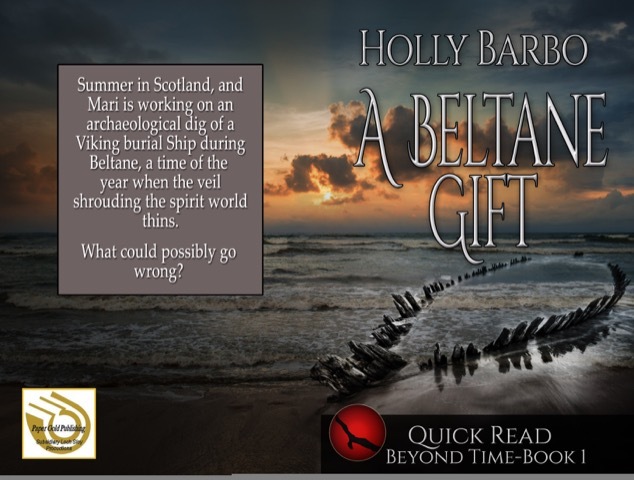 Summer in Scotland, and Mari is working on an archaeological dig of a Viking burial ship during Beltane, a time of the year when the veil shrouding the spirit world thins. A Beltane Gift is a contemporary story with historical elements and a wee bit of the paranormal. It won first prize in the PGP Short Story Competition in August 2015. It is also available as part of the anthology Tendrils. A Beltane Gift, Beyond Time: Book 1, is a story that begs for more. You can follow Mari as she searches for answers in A Bell for Valor. And watch for additional adventures in the Beyond Time series of Quick Reads. A Quick Read book is a short story available as a single small book. In both ebook and paper format, it is a perfect small gift or for escaping to another place and reality when you only have a tiny block of spare time. A wisp of a sound snatched her attention and she looked up, startled. The red fox stood just inside the circle of light cast from her fire. The source of the sound came from what it held in its jaws. Standing, she moved toward the fox, anticipating it would run away. The fox allowed her two steps toward it, then slowly lowered its head and deposited a small animal on the ground before drifting back a few paces into the shadows. She whirled, seeking the source of the voice. It came again. “T’was ah good name an tha fox appreciates it.” Emerging from the shadows was the unsubstantial form of a Viking. With wide eyes she watched… speechless. Holly’s world is shaped by her love of family (which includes an adorable rescue kitty who has stolen her heart), the beauty of nature and an irrepressible curiosity that frequently has her turning over rocks and questioning what she finds. This sometimes sends the reader down a rabbit hole into an alternate view of the world than what they expected. Holly’s mind can be an interesting place.Her motto: Weaving Alternative Worlds with Threads From Today.